All out of eggs? Allergic to eggs? Choose not to eat eggs? You might already have an egg substitute, such as banana or ground flaxseed, in your kitchen! Years ago, I learned that mashed banana could be used as an egg substitute from the Vegetarian Times’ Egg-Free Chocolate-Banana Loaf recipe. Try it; this bread is a real treat! 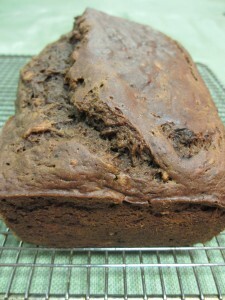 Check out the recipe at http://www.vegetariantimes.com/recipe/egg-free-chocolate-banana-loaf/. I also discovered that 1 Tbsp. of ground flaxseed plus 3 Tbsp. of water could be used to replace 1 egg. I have successfully used this mixture in cornbread and pumpkin cookie recipes. Bits of flax are visible in these baked goods, but barely impart a nutty flavor. I usually enjoy a not-so-sweet corn bread made with 2 Tbsp. of granulated sugar, but the recipe below is for those who love their sweets. The recipe for vegan pumpkin cookies also follows. Preheat oven to 425°F and grease an 8-inch square pan. In a large bowl, whisk together ground flaxseed and water until mixture thickens. In a medium bowl, combine the cornmeal, flour, baking powder, sugar, and salt. To the large bowl containing the flaxseed mixture, add canola oil, milk, and half of the corn kernels. Stir dry mixture into wet ingredients until just mixed. Pour batter into pan and gently push the remaining corn kernels into the batter. Bake bread for 25 minutes. Preheat oven to 350°F and grease two cookie sheets. In a small bowl, whisk together ground flaxseed and water until mixture thickens. In a medium bowl, combine flour, baking powder, baking soda, cinnamon, nutmeg, allspice, and salt. In a large bowl, mix together oil, sugar, pumpkin, vanilla extract, and flaxseed mixture until smooth. Mix in dry ingredients until just combined. Drop flat tablespoonfuls of cookie dough on prepared baking sheets. Bake for 20 minutes and allow cookies to cool. Lightly dust with powdered sugar before serving. Note: Fore more egg replacers and other vegetarian substitutes visit http://www.vegetariantimes.com/article/ingredient-substitution-guide/.